If you don’t know the story of Ernest Emerson, and why he started making knives in his garage in 1979, well…you should. Suffice it to say that it was because he needed a training blade…and the rest is history. Emerson’s knives are billed as the “#1 Hard Use Knives in the World” and as being “Famous in the Worst Places.” These are not just tag lines, because Ernest Emerson is an accomplished martial artist and sought-after tactical trainer- he just also happens to design and build great knives. His CQC series models are widely considered the blueprint for the modern “tactical folder” and are still the standard against which all other folding combat knives are judged. 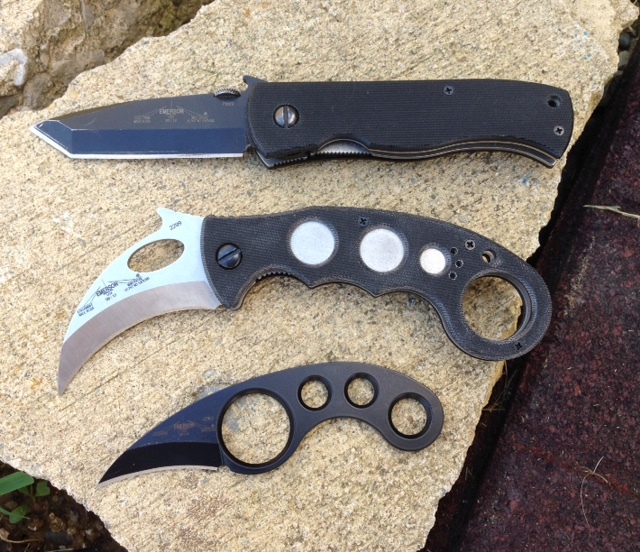 Pictured here are a CQC-7 folder (top) and a Combat Karambit, a contemporary version of the classic fighting blade(center) Both knives are equipped with the Emerson Wave, a small hook at the base of the blade’s spine. The Wave is the strongest and simplest assisted-opening device ever created- confirmed by the fact that respected production knife manufacturers such as Kershaw and Spyderco have used the design under license from Emerson. At bottom is Emerson’s La Griffe, an unobtrusive fixed blade back-up companion. It comes complete with a lightweight kydex sheath and neckchain for unlimited carry options in nearly any environment. Sure, you can buy a cheaper knife. But you’ll not find one designed and built in the U.S.A…by a small, family-owned company…founded by a guy who was and always will be a martial artist…who also just happens to make great knives. Mid-Ohio IMB says check it out for yourself!